Training - Canine Mastery "Positively a Dog School"
This class is a 7-week class and is limited to 9 dogs. In these sessions we teach new puppy owners good management skills and how to prevent problem behavior. Socialization is achieved by puppies playing with each other and other people. During puppy play they learn the concept of bite inhibition, which teaches puppies the appropriate use of their mouths. We stress consistency in training amongst all family members and we work on building a relationship between you and your dog. We also teach attention skills that will become handy if you want to pursue such fun sports as agility, competition, and flyball. Obedience skills that are taught include sit, down, come, stay and leave it, give, loose leash walking and impulse control. This is an entry-level class for dogs over 6 months old, and for people who want to teach their dogs the basics. Consistency in training and its importance will be stressed. You will work on building a better relationship with your dog. Obedience skills include sit, down, come, stay, leave it/give, loose leash walking, impulse control, waiting, and attention. This is a 7-week class and is limited to 9 dogs. This class is a prerequisite for Beginning Agility. This 7-week class builds on the skills learned in Puppy Kindergarten with increases in difficulty, duration, distraction, and distance. Further socialization with the use of play in training will be utilized. Coping with adolescent behavior will be discussed. This is a 7-week class and is limited to 9 dogs. This class is a prerequisite for Beginner 1 Agility and Beyond the Basics. This class builds on skills learned in Basic Manners and Puppy Kindergarten. We work on increasing the difficulty, distance, distractions, and duration of the basic obedience skills. Agility equipment and tricks will be introduced. This class builds on skills learned in Basic Manners and Graduate Puppy. We work on increasing the difficulty, distance, distractions, and duration of the basic obedience skills. Agility equipment and tricks will be introduced. This class will practice and strengthen all the skills required to become a Good Citizen: greeting strangers, greeting other dogs, being touched and groomed while staying under control, how to cope with sound distractions, come when called, and stay. The AKC Canine Good Citizen test will be given on the last week of class by an evaluator and you and your dog can earn an American Kennel Club "CGC" title. Does your dog have 'issues' with other dogs? Do you want to take a class but think your dog will react inappropriately to the other dogs in the group? Feisty Fido is a class for dogs that do not get along well with other dogs and cannot work in a regular class environment. Class size is restricted and visual barriers are provided as necessary so each dog feels secure. We work on calming and desensitizing your dog to the presence of other dogs while teaching the dog to be able to focus on you and learn with you. No previous training is required. The first class is for discussion only to review why some dogs are feistier than others and the ways to begin making them more comfortable around other dogs. We will then familiarize you with the format of the class and introduce you to the training tools and methods we'll be using. Please note that this class is NOT appropriate for dogs that have growled at or bitten a person. For those dogs, evaluation and/or private instruction, which we can also provide, is recommended. We are happy to meet privately with you and your dogs to work with such issues as coming when called, not jumping up, walking on a loose leash, excessive barking, house training issues, noise phobias, etc. If you are having any issue, please call - we may be able to help! Our instructors are also available for private instruction in Agility, Competition Obedience, Freestyle, and other fun activities! A sport that uses your dog’s amazing natural abilities and instinct of hunting to train them to identify and locate food, toy or odor. We use positive reinforcement and elements of detection style training to motivate dogs to search. Dogs LOVE to sniff!!! You can channel that into a fun activity for both you and your dog. This is a great outlet for most dogs who need something to do, including shy dogs or reactive dogs; perfect for senior dogs, as well as young ones. It’s easy for you, and dogs of all shapes and size can participate. Nose Work mentally challenges your dog and burns both physical and mental energy. Nose Work can build your dog’s focus and confidence. If you get hooked like so many before you, you can eventually compete in Nose Work trials… It’s FUN!!! CHECK OUT NOSE WORK AND SEE WHY IT IS ONE OF THE FASTEST GROWING DOG SPORTS IN THE COUNTRY! This series of threeboth classes lays the groundwork for an agility partnership. Whether your goal is competition-bound or for the pet owner looking for a fun activity to enjoy with their canine pal. Safety and enjoyment are first and foremost. This course introduces the dog to the agility equipment, with the object being to develop a strong foundation on which you and dog can build further skills. Focus is on training individual obstacles, through the use of clicker training, to create motivated, enthusiastic dogs as their confidence level soars with the progression of each new obstacle. Since each class progresses upon the previous week's work, attendance for all six weeks is required, and homework is essential to ensure your dog's success. Prerequisites are that the dog must be reliable off leash, be firm in basic commands such as sit, stay, and recall, and must have completed an advanced basic manners training class. This class is geared to the dog and handler that have successfully completed the Beginner 1 Agility class. The focus of this class is to further progress on the individual obstacles, working towards regulation height, and introducing handling skills and small sequences. This course develops the teamwork necessary to successfully negotiate small sequences and off-leash control. Geared to the dog and handler team continuing on from the Intermediate class, this course emphasizes refining your handling skills and body language and introduces slightly longer sequences. Class focuses on developing basic course analysis skills in the handler, while increasing speed and maintaining accuracy in the dog's performance of the obstacles, all while building upon the team's communication skills. For those that have completed basic obedience classes and want to continue on with the hopes of earning a Champion Dog "CD" title on their dog. For those wanting to learn and polish the principle exercises in the open level of AKC obedience. Participants will more than likely be seeking a Champion Dog Excellent "CDX" title. For those aspiring to the highest level of obedience competition. A Utility Dog "UD" title or a Utility Dog Excellent "UDX" title are truly a magnificent feat. "Rally O" is the latest AKC event that combines elements of obedience, agility, and sports car rallies. The sport allows you to talk with your dog while the dog and handler team heel continuously and perform the exercises indicated by the signs at each location. Rally exercises include right and left turns, U-turns, circles, about turns, figure-eights, jumps, recalls, finishes, and stand for exam. Scoring is based on how well the dog executes each command and remains in heel position. The emphasis of Rally is more relaxed sion competitive obedience, focusing instead on attitude and enthusiasm, while the variety of exercises allows you to show off your versatility and teamwork. 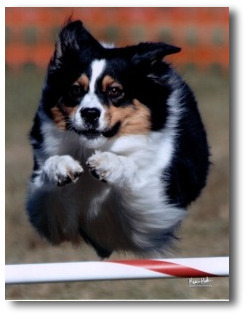 Rally is a titling sport by both the American Kennel Club and the Association of Pet Dog Trainers. AKC offers titles for purebred dogs to complement its traditional obedience titles. APDT provides titles for both pure and mixed breeds.